When using our services, there are no hidden fees. Submitting an application simply qualifies the customer for a loan. The fees are charged only when the customer agrees to have the loan issued. Our trusted lender will charge a flat fee ranging from £21.98 to £29.98 for each £100 you borrow. Your loan fee is determined by the lender (at its absolute discretion) based on data acquired at the time of the application for credit. 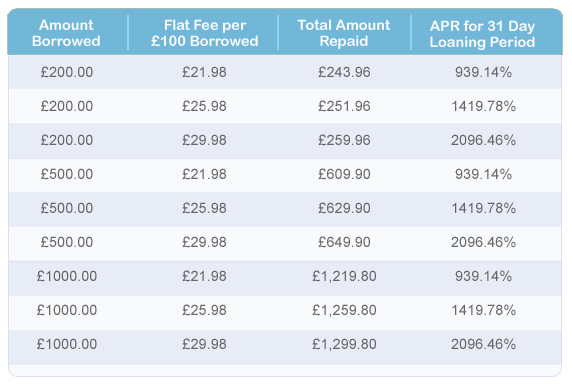 Please take a moment to view our rates table to see the exact amount you can expect to repay for whichever amount you wish to borrow.